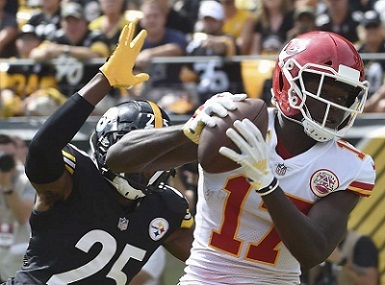 Taken from a gradebook of a teacher who heard all the right things about the ½ his class that went to summer school and now wonders if it was all a mirage, here is the Pittsburgh Steelers Report Card for the 42-37 loss to the Chiefs. The stat sheet says that Ben Roethlisberger was only sacked once and only hit 3 times. And it is true that the Big Ben had ample time to throw on numerous occasions. However, there were other times early in the game when he was rushed and those possessions ended in punts. And the lone sack came on the drive after the Steelers defense had scored a safety, and helped kill any momentum. The Chiefs also registered 5 tackles behind the Steelers line of scrimmage. How bad were the Steelers special teams? Chris Boswell missed both a field goal and an extra point and even together two plays do not provide the unit’s key lowlights. D’Anthony Thomas 31-yard punt return set up KC’s first touchdown. 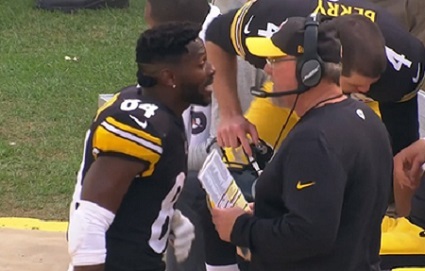 A Matthew Thomas penalty nullified an Antonio Brown punt return to the Steelers 47. Jordan Berry did have one nice punt that pinned Kansas City down, but Mike Tomlin thought enough to mention punting during his press conference. Whether it is because of execution or play calling, the Steelers offense has now started slowly in two games and sputtered at critical moments in the fourth quarters of games. With that said, Randy Fitchner’s offense put up enough points to win in a normal situation. …But the Steelers offense was hardly in a normal situation against the Chiefs. Losing Ryan Shazier dealt a devastating blow to the Steelers defense, but Kevin Colbert, Mike Tomlin and Keith Butler have had 287 days to react to that loss. In that time the Steelers have made numerous changes and position scuffles, and designed and deployed any number of subpackages and schemes all aimed at improving the defense. Unfortunately, the Steelers defense starts 2018 worse than it finished 2017. It was a rough day, but after special teams and offensive penalties ruined the chance to capitalize on the safety, all appeared lost. 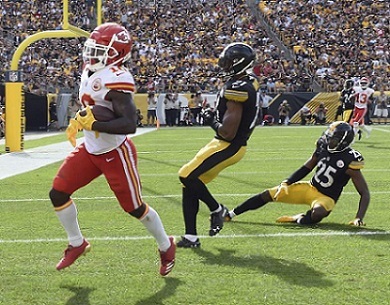 Yet one man stepped up and make a heads up lay by forcing a fumble, which gave the Steelers new life, and that player was Cam Heyward and for that he is the Unsung Hero of the loss to the Chiefs. Taken from the gradebook of a teacher whose dismayed that his star pupil can’t seem to perform except when sitting at his own desk, here is the Pittsburgh Steelers Report Card for the Opening Day Tie against the Browns. Jordan Berry, who had a mediocre at best preseason, played a good game boming off punts when the Steelers needed him to. Ryan Switzer, while not breaking one, showed himself as a kick returner who had the potential to make something happen, a rarity in Pittsburgh. And the Steelers special teams partially blocked a punt and blocked a field goal to save the tie. 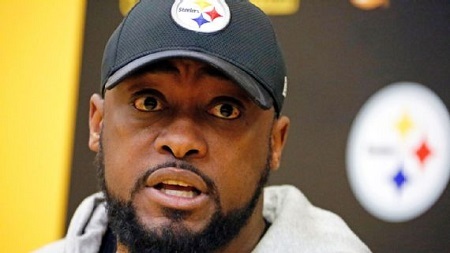 Mike Tomlin took a lot of grief from the fans immediately after the game, which is understandable. While a tie is better than a loss, the “W” the Steelers were counting on could easily come back to haunt them with it comes to tie breaker time. On the defensive side of the ball, Keith Butler’s unit played a strong, although not perfect game. A defense that must compensate for 6 offensive turnovers is starting with an incredible handicap. 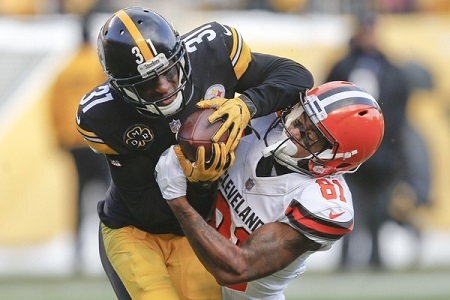 The Steelers defense pressured the quarterback, limited Cleveland’s running game and didn’t allow a pass play over 40 yards – although Cleveland hit two for 38 and 39. On the offensive side of the ball, it was Randy Fichtner’s first game as a signal caller, and some of the same Todd Haley haters were already criticizing him for becoming too conservative in the 4th quarter, arguing “Haley would have kept his foot on the gas.” The fact is that the Steelers offense looked tentative during the 4th quarter and overtime after a strong third quarter. The key to this game was turnovers. Coaches don’t throw picks or fumble balls. The record will forever reflect that James Conner’s first start was a success. But that didn’t happen in a vacuum. ON play after play, Roosevelt Nix was plowing would be Cleveland tacklers out of plays. Nix also helped partially block the punt in overtime, and for that Roosevelt Nix wins the Unsung Hero Award for the tie against Cleveland. 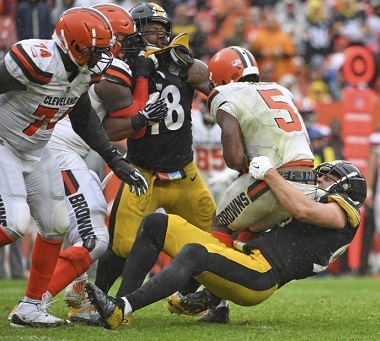 The Pittsburgh Steelers opened their 2018 season on the shores of Lake Eire against the Cleveland Browns and came away with… an UGLY 21-21 tie against a team that hadn’t won in over 600 days. The tie stirred up Steelers Nation’s Gloom and Doom contingent, who’re wasting little time in declaring the entire season a total loss. And their response, is understandable — to a point. A tie football game satisfies no one. It’s like grabbing a still warm mug only to have your mouth find lukewarm coffee. While you certainly lose nothing in a tie football game, you fail to gain anything. 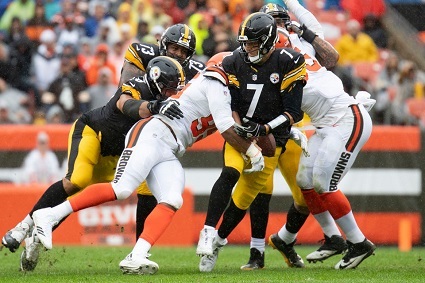 While the Steelers 21-21 tie with the Browns is a cause for disappointment, Pittsburgh’s performance provided no shortage of positive plays, and its one legitimate area of concern revolves around quarterback Ben Roethlisberger. 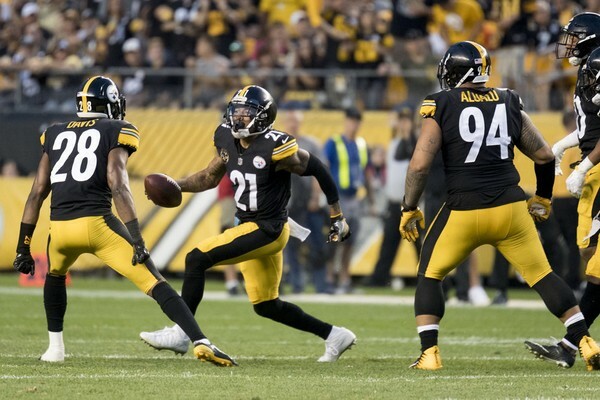 One of the key questions facing the Steelers going into the opener was whether they could run the ball effectively while Le’Veon Bell remained AWOL. It was only one game, but James Conner provided a resounding answer in the affirmative. James Conner justified the faith that his teammates invested in him by running hard and playing at the level of a starting NFL running back. James Conner hit the holes with authority, proved himself a capable target in the passing game, and scored on two separate occasions. Conner’s second TD came on a 22 yard run where the former Pitt Panther showed excellent instincts and hustle. James Conner’s fumble certainly counts as a costly mistake, but if his game against the Browns is any indication of what he is capable of for the rest of the season, the retailers at Station Square would be wise to start selling “Le’Veon Who?” T-Shirts. The Steelers defense entered the game as an even bigger question mark than James Conner. The last time we saw this unit, the Jacksonville Jaguars were putting up points and racking up yards as if they were the Greatest Show on Turf. The Steelers opened themselves to a lot of criticism for their performance against the Browns. But very little of the criticism should be directed against the defense. Then came the first drive of the 2nd half. The Steelers started things off right by sacking T.J. Watt, then let the Browns right back into it with two successive penalties. Before too long, Tyrod Taylor was out juking Bud Dupree and lowering his shoulder against Artie Burns for a touchdown. Although that drive came far too close to the Jacksonville game for comfort, it represented the low point for the Steelers defense. Statisticians can make this as fine a point as they want, but when your offense gives up 6 turnovers, you’re not only supposed to lose a game, you’re supposed to lose it badly. The Steelers didn’t lose to the Browns and they can thank their defense for that. Mike Hilton broke up multiple passes. T.J. Watt recorded four sacks, and looked every bit like a young player blossoming into a dominant one. Cam Heyward, Jon Bostic and Bud Dupree had sacks. The Steelers defense will face stiffer tests than those offered by the Browns. Cleveland’s tying touchdown came far too easily, but when Cleveland tried to pick on Cam Sutton again, Sutton made them pay the interception that forced over time. That type of bounce back, paired shut down performance of the Steelers defense during over time offers hope that the arrow is pointed up for Keith Butler’s boys. The Pittsburgh Steelers failed to win in Cleveland because they committed 6 turnovers. Of those 6, quarterback Ben Roethlisberger turned over the ball 5 times. Two of Ben Roethlisberger’s interceptions in the first half were outright hideous. Ben Roethlisberger appeared to be trying to force the ball to Antonio Brown on one occasion. On a second pick the duo was clearly out of sync. Unfortunately, that wasn’t true. During the 4th quarter Ben Roethlisberger was ineffective and played tentatively during the critical stretch when the quarter was winding down and again in overtime. Worse yet, he coughed up the ball twice. Neither those turnovers were entirely his fault, but Ben Roethlisberger has made a career of moving around in the pocket making something out of nothing. In the Steelers 21-21 tie with the Browns Ben Roethlisberger was unable to do that. As Mike Tomlin conceded, the Steelers had opportunities to win, despite the turnovers. Chris Boswell missed a difficult, yet makeable field goal which should have have won the game in over time. The Steelers defense came up with a key stop after Roethlisberger’s final fumble in regulation, yet the offense could do nothing. In overtime the defense limited Taylor to 1 completion, forced two punts and the special teams partially blocked a punt and blocked a field goal. Unfortuantely, the Steelers didn’t win. Football is the ultimate team game, and the observations above help show that winning and losing never comes down to the efforts of one player. 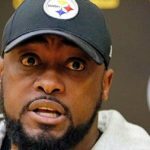 But the 2018 Pittsburgh Steelers are built around Ben Roethlisberger, and when he is below the line, its very difficult for the rest of the team to pull itself above the line. Ben Roethlisberger was below the line in the Steelers 21-21 tie with the Browns, and because of that Pittsburgh has already put itself at a disadvantage in the AFC North race. All eyes at St. Vincents are on Pittsburgh’s position battles at safety, inside linebacker, and running back. 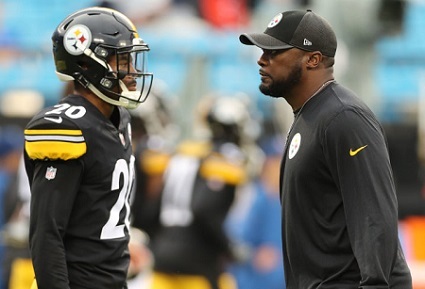 But in many ways, the die has already been cast, with the true test at this Steelers training camp will be of Mike Tomlin and Kevin Colbert’s ability to evaluate defensive talent. The Pittsburgh Steelers post-Super Bowl rebuilding phase has been over for some time. Ben Roethlisberger is the only veteran who remains from Super Bowl XLIII. Only Ramon Foster, Maurkice Pouncey and Antonio Brown remain from Super Bowl XLV. The Pittsburgh Steelers have steadily improved since their nightmare 2-6 start to the 2013 season, and with each season they’ve gotten closer to climbing the Stairway to Seven. Progress crashed to an abrupt halt last January in the playoff loss to the Jaguars. 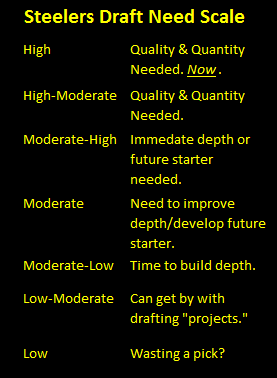 It might seem a bit contradictory to run a blog post questioning the Steelers collective defensive talent evaluation skills, but it is not. Losing Ryan Shazier was a game-changer for the Steelers in 2017. Everyone accepts that. Now. But what people forget is that the Steelers decision to draft Ryan Shazier was a questionable one and many fans were labeling Shazier a “bust” as recently as 2016. In a similar vein, Kevin Colbert and Mike Tomlin clearly made the right choices when it came to Cam Heyward, Stephon Tuitt, Vince Williams (remember the guy was a 6th round pick) and Joe Haden. But Kevin Colbert and Mike Tomlin have swung and missed on the defensive rebuild. And those misses have carried real costs. Missing on a premium pick requires you to redraft for the same position, forcing you to forgo talent elsewhere. Shamarko Thomas never contributed outside of special teams, forcing the Steelers to invest another premium pick on Sean Davis. Jarvis Jones qualifies as the first unquestioned first round bust of Kevin Colbert’s tenure, and that move led the Steelers to draft Bud Dupree and T.J. Watt. Then stir in the battle at inside linebacker. Tyler Matakevich and free agent Jon Bostic will vie to “replace” Ryan Shazier. Matakevich is a fan favorite, an inside linebacker in the mold of Jerry Olsavsky. The sentimentally is nice, but fails to compensate for athleticism. Bostic looks like a serviceable player – when healthy. The Steelers coaching staff seems to understand that neither player offers the athleticism needed in the middle of the field. Talk of deploying sub packages that use Morgan Burnett and/or Terrell Edmunds in some sort of hybrid safety-inside linebacker position dominated the off season. As others have observed, fans clamored for Ryan Shazier to switch to safety; now the Steelers are using safeties to try to replace him. It is important to remember that the Steelers 2017 defense actually looked pretty good at times, broaching shut down level against Kansas City and Cincinnati and playing really tough in the Red Zone against Detroit. 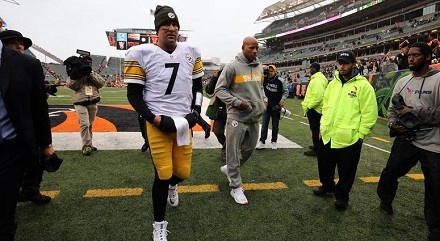 Ryan Shazier was a key player in making that happen, but he didn’t do it himself. By sticking to their board and refusing to reach for defensive in the 2018 NFL Draft Kevin Colbert and Mike Tomlin implicitly acknowledge that. If nothing else, the duo is being true to themselves, as they’ve never made personnel decisions of fear. Now its time to see how whether their self-confidence is justified or not.